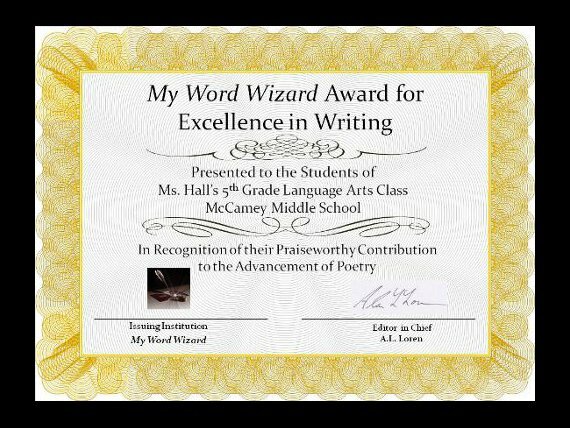 Recognized by the editorial team at My Word Wizard for their "Praiseworthy Contribution to the Advancement of Poetry," we are proud to bring you a selection of original poems written by the students of Ms. Hall's fifth grade language arts class at McCamey Middle School. We are sure you will enjoy the talents of these gifted young poets and we look forward to much more of their work. pushed the line too far. he is in a better place now. Like a little pesky fly. I wish he would go "bye, bye". He will take a dare. Yes, he's my little cousin. We may say "I hate you!" But, I love him a dozen! Yeah! Yeah! My friends are coming! YAHOO! My friends are here! and nice like a teddy bear. Rustle, rustle go the leaves under me. Vroom, vroom go the cars passing by. I don't have the courage to give it to her. even if she thinks I'm a big fat lard. but it's filled with lies. and eats like a pig. And he is a master at the "Cupid Shuffle." He runs like the wind. and he always puts up a good fight. Woof! Woof! There goes my dog. Boing! Boing! My dog is running. Hiss! Hiss! He's chasing a cat. And also likes playing in puddles. I love my dog very much. and bark as loud as a bull horn. and he loves us too. and fat like an elephant. and fast like a cheetah. Chirp! Chirp! the birds go. Shake, shake, goes the tree. Scratch,scratch, the baby birds go. Snore! Snore! Goes to bed! Stomp! stomp! We're going to the next class. Swish! Swish! Someone sticks out their leg. Boom! Someone trips and falls face first! Ding! Ding! Goes the bell. Stomp! Stomp! Running up the stairs. Bam! Fell over a chair! Slam! Slam! Goes the lockers. Ding! Ding! Tardy bell rings. My dog acts like a deer. My dog's eyes are red like the devil. My dog is as fluffy as human hair. I will always love my crazy dog. but I still love you the most. but still lovable, like my mom. Vroom! Vroom! goes the truck. Slam! Slam! go the truck doors. Crunch! Crunch! go the leaves. Zip, Zip goes the zipper on the tent. Rush, rush go my feet. Splash, splash goes the river water. My dog is as fast as a cheetah. She'll play fetch if you throw a ball. and drift like a NASCAR turning. The polar bear is as white as snow. His eyes are brown like chocolate. He lives where it is as cold as a freezer. My mom is as sweet as bubble gum. saves me when I am in trouble. My brother is nice and cool. Sure, we fight, but we're cool. I have the coolest family in the world! Jingle, jingle go the bells on my dog's collar. My dog dropped the bowl. he is everything I want to see. Mom you are the star of my eye. to have you as a mother. hoping you will not get sick. Your eyes are like flashing lights. Your hair is like the midnight sky. Your eyes are dark brown like a crayon. Your skin is a true Mexican color. That is why you know a lot of Spanish. and I might get mad at you. Deep down, I will always love you! There is no fun without light.